The Conference Board released its monthly report on consumer confidence. It declined by nearly 5 points on a scale of 100 in only one month. In August the Conference Board rated consumer confidence at 53.2; its most recent indicator is at 48.5. Despite hype by Obama administration officials that the American economy is “headed in the right direction,” the consumers are not buying it. And they are not buying much of anything else, as weak consumer demand continues to undermine the deficit-popping government stimulus program, which is now ending. With artificial life-support by the government of the wounded U.S. economy in its terminal phase, it is likely that the American housing market will continue its role of deconstructing what is left of the economy and consumer confidence. The latest Case-Shiller home price index reveals continued contraction. This is not a good omen, as government programs for propping up the residential real-estate market are winding down. Is A Currency War in the Cards? The recent moves by the Bank of Japan in driving down the value of the yen, on top of the continuing row over the value of the Chinese Renminbi or yuan, may be signs of a growing risk of a currency war by advanced and major emerging economies. With the risk of a double dip recession increasing, the transitory and increasingly marginalized economic recovery from the implosion of 2008 running out of steam after massive doses of public debt growth and the bond markets beginning to get restless over government deficits that are out of control, the supposedly unified G20 may be looking to their currencies as a last ditch attempt to reverse disastrous rates of unemployment. It is ironic that devaluing one’s own currency is seen as being the best move on the grim economic horizon. However, with central bank interest rates of near zero percent having failed to unleash sustained economic growth, and debt-saturated fiscal policy proving as feeble as monetary policy, currency devaluation may be seen as the only viable option left for policymakers. In theory, a cheapened currency makes a nation’s exports more competitive, while adding a premium on imports, leading to a better current account balance and growth in export-based manufacturing sectors. Devaluation is also a way of reducing the real value of the national debt. The problem with this approach is that it is not unilateral; other countries can play around with their currencies. Furthermore, trying to effectively restructure your debt on the sly through devaluation will undoubtedly choke off cheap sources of credit. If the recent currency moves are pointing towards increased currency manipulation by sovereigns, my belief is that this approach will prove every bit as ineffective as has been massive government deficits and zero interests rates offered by central banks. An additional signpost on the road to a double dip recession for advanced economies came from the latest briefing note issued by the International Monetary Fund. According to the IMF, global economic growth is likely to shrink in the last quarter of 2010. In essence, this means that the supposed recovery, artificially stimulated by unprecedented levels of public debt, has in effect failed. The contents of the IMF briefing note contains other indicators of growing concern about the future trajectory of the global economic crisis. There is a stern warning about unsustainable public deficits in advanced economies that need to be reined in; imbalance in the level of exports versus imports in these same economies; growing risks of proliferation of sovereign debt crises similar to what Greece is currently experiencing. Perhaps the most sober element in the IMF report is a warning about the ramifications of the worsening home repossession crisis in the United States. Since the U.S. housing market was ground zero for the 2008 global financial crisis, this would seem to indicate that the other shoe is still to drop on American real estate weaknesses and the further damage it may inflict on the global economy. Nouriel Roubini Sees Growing Risk of Double Dip Recession in the U.S.
NYU Economics Professor Nouriel Roubini believes that the risk of a double dip recession is growing in the United States. He assesses the probability of a double dip at 40%, the other scenario being subpar economic growth (under one percent), which feels like a recession in terms of high unemployment, growing public deficits, declining home values and increased losses among banks and financial institutions. The downbeat perspective of Roubini on the U.S. economy extends to Europe, where he believes the recent impressive growth figures in Germany are merely temporary. Furthermore, he points out, Germany is the best performing economy in the Eurozone, where the remaining countries are facing disaster. Half of the Eurozone is already experiencing a double dip recession. In addition, Japan is courting a double dip, and even strong emerging economies such as China are showing signs of an economic slowdown. The economist known as “Dr. Doom” is actually trying to view economic trends in a realistic manner. If his interpretation of emerging trends strikes a chord of doom and gloom, one needs to look critically at those trends rather than marginalize the messenger. It should be recalled that when Nouriel Roubini issued his warning about the coming collapse of the financial order as we once knew it, based on a house of cards and subprime mortgages, he was harshly ridiculed by many mainstream economists. All the more reason to listen to what he has to say about the current state of the global economy. 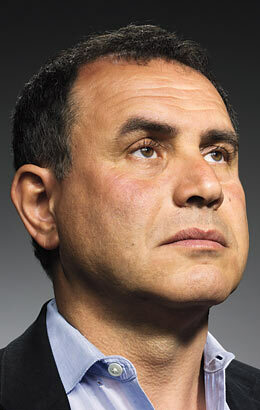 Overall, I have not seen Professor Roubini so gloomy on the state of the global economy since his prescient warnings of financial Armageddon approaching in the months leading up to the implosion of the investment banks in the summer and fall of 2008. Ireland’s own case of a financial institution that is “too big to fail” will probably in the end impose a penalty of €70billion on the already beleaguered people of Ireland, according to a prediction made by the Irish prime minister, Brian Cowen . The tale of woes concerning this bank I have reported on in a previous blog posting. Let us just point out that if this projection is correct, every man, woman and child in Ireland, which has a population of about 6.2 million, will pay 11,280 euros for this financial disaster not of their making, or about 14,500 U.S. dollars at the current exchange rate. If a typical Irish family of four is told they must fork over approximately sixty thousand dollars to bailout the no doubt well paid (and well bunused) executives of Anglo Irish Bank and their bond holders, will they remain quiescent? On top of massive unemployment, brutalizing austerity and a shaky economic future, the people of Ireland must now add higher future taxes to pay off the excesses of a few to their growing tab of financial and economic suffering. President Barack Obama is scheduled to address the nation on the end of the American combat role in Iraq. Fifty thousand troops will remain behind to train the Iraqi security forces, and with massive bases remaining and the country’s biggest embassy located in Baghdad, it is clear that a long-term U.S. presence in Iraq is foreseen. The road has been a long one since the previous president, George W. Bush, formally announced the “end” of American major combat operations in Iraq from the deck of an aircraft carrier, more than 7 years ago. In the current economic purgatory that America finds itself in, it is astonishing that no policymaker has been held accountable for this $3 trillion “mistake” (mistake, that is, for those who believe the invasion was really based on the claim that Iraq possessed weapons of mass destruction-as opposed to reengineering the Middle East and securing oil resources). However, these same policymakers tell us to relax, the war was placed on the nation’s proverbial credit card, so it will be the children and grandchildren of America who will eventually pay for the Iraq military conflict. But what about the costs of the Afghanistan war, which will likely reach and may exceed the figures that Stiglitz and Bilmes calculated for the Iraq conflict? Add them all up together, factor in the structural mega-deficits and costly financial bailouts engineered by the politicians in Washington, and one cannot escape the conclusion that it will be bankruptcy, not victory, which will be the final outcome and legacy of America‘s war on Iraq.